GLORY sent out the following press release this morning. Their first event of 2018 will be here in Chicago at the UIC Pavillion. DENVER – GLORY, the world’s premier kickboxing league, today announced the date and venue of its first event of 2018. 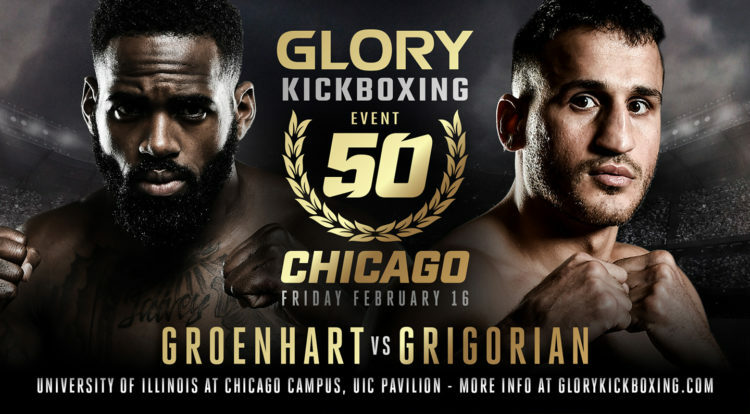 Located on the University of Illinois at Chicago campus, UIC Pavillion will be the site of GLORY 50 Chicago and GLORY 50 SuperFight Series on Friday, Feb. 16. “We [as an organization] have made commitments to the Chicago area, including two greatly successful events in 2017,” said GLORY CEO Jon J Franklin. “The passionate kickboxing fanbase [in Chicagoland] has consistently rewarded us with infectious energy and a lively crowd. GLORY 50 Chicago is headlined by a trilogy fight for the GLORY welterweight world championship. Rivals Murthel “The Predator” Groenhart (67-22-3, 38 KO, fighting out of the Netherlands) and Harut Grigorian (46-11, 32 KO, fighting out of the Netherlands) met for a second time in June, but the encounter ended in controversy. After Groenhardt landed a knee in the second round, Grigorian turned away from his opponent, leading to an unimpeded knockout punch by “The Predator.” Following the finish, two men attacked Groenhart in the ring. While the assailants were apprehended and Groenhart walked away uninjured, the finishing sequence and ensuing attack have heightened intrigue in a rubber match. Since the previous bout, Groenhart has gone on to become champion, dethroning Cedric Doumbe at GLORY 44 Chicago in August. On the same fight card, Grigorian defeated both Karim Benmansour and Antoine Pinto during a one-night, four-man contender tournament, earning a No. 2 welterweight ranking and the trilogy bout with Groenhart. Additional bouts for GLORY 50 Chicago and GLORY 50 SuperFight Series will be announced shortly. Tickets for GLORY 50 Chicago and GLORY 50 SuperFight Series go on sale at midnight (Central Time) on Saturday, Dec. 9. Tickets will be available for online purchase at ticketmaster.com, the UIC Pavilion Box Office and all Ticketmaster retail locations. Fans who subscribe to the GLORY Fight Club newsletter (at glorykickboxing.com), follow GLORY on Twitter, like GLORY on Facebook or follow GLORY on Instagram will have the opportunity to purchase premium seating early, at an exclusive pre-sale rate. The pre-sale, which started today, will end at midnight (Central Time) on Saturday, Dec. 9 – when tickets go on sale to the general public. ← Previous Story WWE and Virtual Reality – What’s the Connection?